Does your yard need some new shade trees, ornamental trees, or shrubs? View info and images for all of the tree and plant types we carry. Come and see our extensive tree nursery. 6 acres of all of your favorite native species. Open to the public 6 days a week. "I am very impressed with the service from D&B. I had a tree that for some reason did not make it. They were very accommodating in replacing it and they did an excellent job. Thanks very much Victor and D&B." Here are some reviews and testimonials from our clients. If you were satisfied with our service, please share your experience and write us a review on Google. "I have bought trees off & on from other nurseries in town, but only from D&B Tree Company Inc. in the last 5 years. This company has the best selection to choose from. Their price includes delivery & planting, even if they find rock. These guys are prepared with the equipment to take care of the digging at no extra charge. The purchase of a tree includes delivery, planting, mulching, and compost soil (they don't use the same soil that it is already there). They have the hardest working crew that knows what their doing. One of my trees died due to the drought last year, and they replaced it right away. I will continue coming back for more trees in the near future. This is my tree nursery place to shop when I need any thing. I would recommend this company for your tree needs any time. They are the best!" "I recently purchased some trees from D&B and I was very satisfied with the level of service and quality of the work. Jessy has helped me repeatedly with my questions and she has always provided me the highest level of customer service. She is both knowledgeable and friendly. David and the staff at D&B are very professional and I will definitely consider D&B for my next tree purchase." "Thank you again for the great trees. The team that put them in the ground were quick and efficient and the trees look beautiful." "I can't tell you how much we appreciate D & B Nursery. We bought an Oak tree from D&B 3 years ago. They came out and planted it. A few months ago it started dying. We were very upset because, it had been a family outing to pick that tree out, we wanted our youngest son to watch it grow with him, and when he would come back home after growing up he would always remember that tree and our time together picking it out.. We knew our warranty was up, but our experiences with D&B had been very pleasant. After finding the tree we wanted, we went back to D&B to replace it. I believe their warranty is a year, so we knew it was well past the time to have it replaced, and were ready pay for the new one. The gentleman that helped us was David. After explaining to him why we were back, he told us he would replace the tree for us free of charge. We were speechless! He said he wanted to give the best customer service he could, and would be out to our home to take the old one and plant the new one, all free of charge. I have to say in this day and age, you just DO NOT find that kind of customer service anywhere anymore. I can't tell you how impressed I am with their company. My husband and I will never shop anywhere else but D&B Nursery for all of our landscaping needs. I want to say again, "Thank You", for being compassionate in your customer needs. You have us as customers for life, and I will recommend your establishment to everyone I get a chance to." "Thank you David for taking care of us with our tree problem. We had purchased two 45gal live oak trees and one just never seemed to get established despite all that my husband and I did to nourish it. Upon calling you to tell you what had transpired, you sent one of your guys out within a few days to inspect the issue and to our pleasant surprise, replaced the tree with a new live oak which we saw when we got home from work. It is so very appreciated to work with professionals who do stand by what they sell and I wanted to be sure and say thank you so very much to you and your team." 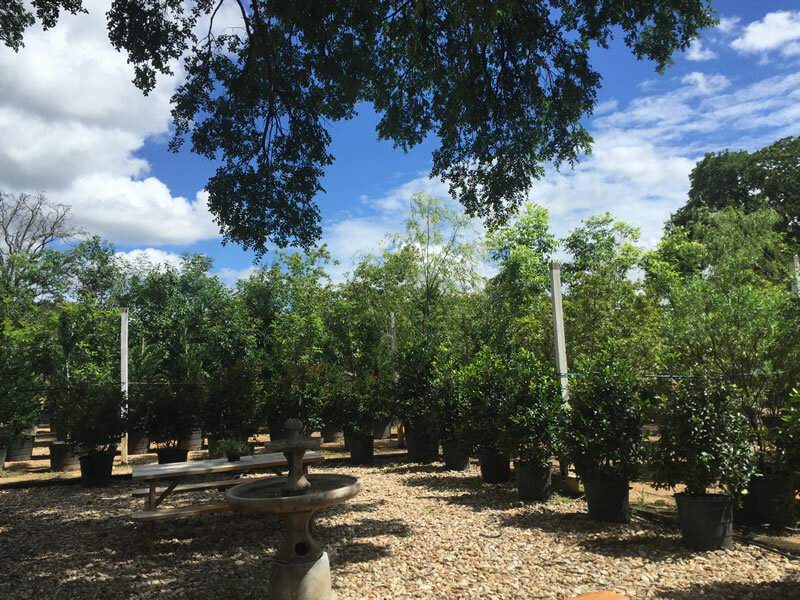 "David personally designed our landscaping and his crew planted 20 trees last year. His crew was professional and hauled away all scraps. The trees are growing great and added the privacy and beauty that we planned."